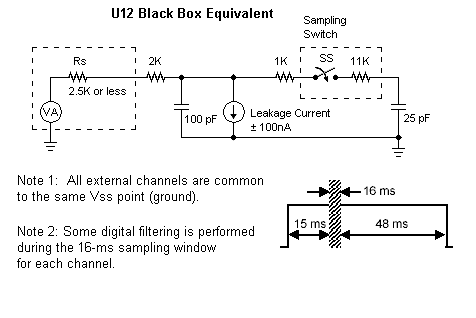 This note looks at input impedance characteristics of the HOBO U12 loggers with external inputs. "Rs" and "VA" in the attached diagram represent your source impedance. Black Box equivalent: If an input channel is de-selected or when it is not measuring a voltage, that input nominally looks like 2K resistance in series with a 100pF capacitor. The leakage current may look like a nominal 5M resistance. When switched into the A-D circuit to be measured, that input looks like a 12K resistor in series with a 25pf capacitor has been added to the network. Some digital filtering is performed during the sampling window. Maximum recommended source impedance:the maximum recommended impedance for analog sources is 2.5 K. This value is calculated based on the maximum leakage current of the input pin. The leakage current is 100 nA max, and the analog input voltage cannot be varied by more than 1/4 LSb or 250 µV due to leakage. This places a requirement on the input impedance of 250 µV/100 nA = 2.5 k.